Looks like AI will be getting out of Philly...There was series of bizarre events, where Coach Maurice Cheeks and GM Billy King sent Iverson home before their loss to Washington, and told him not to play tonight or tomorrow. Sixers chairman Ed Snider confirmed that Iverson did ask this week to be dealt. "We're going to trade him," Snider said. "At a certain point, you have to come to grips with the fact that it's not working. He wants out and we're ready to accommodate him." PHILADELPHIA (AP) -- Allen Iverson is no longer Philadelphia's headache. Then again, maybe it's the other way around. Either way, this much is sure: One of the great players in franchise history has likely played his last game for the 76ers. Iverson wants out and Philadelphia will grant his wish. "It's just time for him to go his way and for us to go our way," Sixers chairman Ed Snider said Friday night. During a bizarre day, Iverson was first banished by the club for two games and then Snider said the Sixers would trade their disgruntled franchise player after he asked to be dealt. 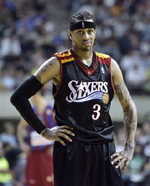 It would end Iverson's 11-year stint with the team that made him the No. 1 pick in the 1996 draft. The A.I. era is all but over. "As hard as it is to admit, a change may be the best thing for everyone," Iverson said. "I hate admitting that because I love the guys on the team and the city of Philadelphia. I truly wanted to retire a 76er." Team president Billy King and coach Maurice Cheeks said Iverson was sent home before Friday night's 113-98 loss to the Washington Wizards because he didn't practice a day earlier and left Wednesday's blowout loss at Chicago with back spasms. King said the move was not a suspension and Iverson's future would be re-evaluated after Saturday night's game at Orlando. "Allen was not able to practice (Thursday) because of the back and today Mo made a decision not to play him tonight or tomorrow," King said. "We told him to just take the night off and tomorrow." Snider confirmed that Iverson did ask this week to be dealt. Snider said Iverson has "probably" played his last game with the Sixers, ending a career that placed him with Julius Erving, Charles Barkley and Wilt Chamberlain among the team's greats. "I really didn't see it coming because Allen says all the right things, and I thought that he really was behind Mo and what we were trying to accomplish," Snider said. "Obviously, he's not." Iverson, whose off-court behavior and coaching clashes often overshadowed his gritty, highlight-reel play, released a statement through agent Leon Rose stating that he told the Sixers he was healthy enough to play. Iverson said he was told not to participate in shootaround and instead watched from the sideline. He joined the Sixers in the huddle, then was told by Cheeks not to come to the Wachovia Center. In my entire career, even the doctors haven't been able to tell me not to play," Iverson said. "I've played through injury and illness. I think everyone knows how much I love being out on the court, competing and winning. That's why it was so disheartening to be told that I couldn't play, knowing that I was ready. It hurt even more to be told not to come at all." Iverson, who is second in the NBA in scoring at 31.2 points per game, left Wednesday night's 121-94 loss at Chicago in the second half, complaining of back spasms, and didn't practice Thursday. The Sixers are 5-13 and have lost six straight and 13 of 15 overall. "This season has been very frustrating for everyone," Iverson said. "I have expressed my frustration to my teammates, however, I have continued to give 100 percent night in and night out. Apparently, it hasn't been enough to help our team win." Even with the Sixers sinking toward another lottery-bound season, Snider said Cheeks' and King's jobs were safe. The losses and Iverson's petulance also have led to a splintered relationship with Cheeks. Iverson left a practice last week reportedly after a disagreement with Cheeks and skipped a team bowling function for season-ticket holders later that night. He apologized and was fined by the organization. "It happens," Cheeks said. "Sometimes coaches and players disagree." The foundering Sixers missed the playoffs last season for the second time in three seasons, leaving King to proclaim at the NBA draft lottery it was time to "change the culture." It has changed, but arguably for the worse. Iverson reportedly was nearly dealt last offseason to Boston, and complained the trade talk took a toll on him and his family. A late July visit from King finally assured Iverson he wasn't going anywhere, and Iverson repeated a familiar pledge in training camp that he wanted to end his career with the Sixers. "I always wanted to stay here because of the loyalty, but it's all I know," he said then. Iverson, the No. 1 pick in the 1996 draft and a seven-time All-Star, has won four scoring titles, two All-Star game MVPs and the league MVP award in 2001 after taking the Sixers to the NBA finals. "He's one of the greatest basketball players of all time, he has incredible talent, he's done a lot of great things for this organization and we wish him well," Snider said.